Check out line ups for 6-2 volleyball rotation. Find out placements and running routes for players in volleyball 6 2 rotation. Setter in the front row is often replaced by an offensive player. 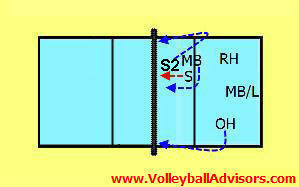 We are marking setters S1 and S2 on all rotations, so it will be easier to understand their positions on the court. The following picture is the basic starting serve receive line up in 6-2 offense. Setter is in the right back position. The other setter, S2 (or a hitter if replaced) plays in the left front position. 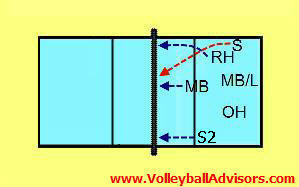 This image is the serve receive line up when back row setter is in the middle back position in 6-2 volleyball offense. 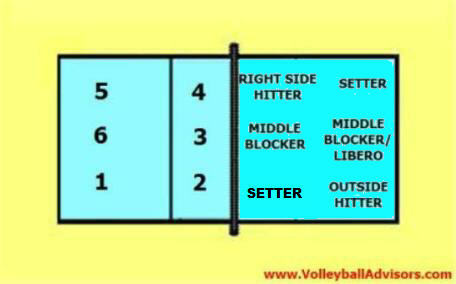 The other setter, S2 (or hitter if replaced) is in the middle front position and switches herself to the right front position when appropriate. The image is the basic serve receive line up when back row setter is in the left back position in 6-2 offensive rotation. The other setter (or the hitter if replaced) is in the right front position. 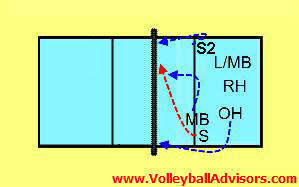 The basic starting serve receive line up when setter (S2) is in the right back position in 6-2 volleyball rotation. The other setter (S) is in left front position. In this formation the front row setter is one of the primary passers. Other choice is to pull the outside hitter (OH) from the right front position to pass the ball and the setter pulls over all the way to the left, leaving the left side of the court to RH and MB/L. 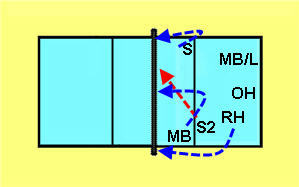 The following image is a serve receive line up when back row setter is in the middle back position in 6-2 offense. The other setter is in the middle front position. The next picture is the serve receive line up when back row setter is in the left back position in 6-2 offense. The other setter is in the right front position. In this picture below the front row setter (or the hitter, if the setter is replaced) is not serve receiving the ball. Like mentioned before, rotations can be formed multiple ways - this is not the only way to do it. The coach could for example make the right front setter the primary passer. 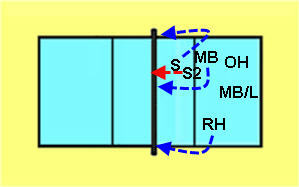 The common rotating fault in this situation occurs when RH is NOT in front of OH at the serving moment. RH needs to be closer to the net than OH (because RH is the middle front player and OH is the middle back player.) Naturally the front row player needs to be closer to the net. Basic Volleyball Rules - How to Win More Points for Your Team? Check out how you can win more points by following examples of these rules of volleyball cases.